Is it time for Ireland to develop a national soccer museum? As Ireland is now more than half way through the decade of centenaries which commemorate the key events leading to the establishment of the state, it is time to begin to consider how we are to remember and memorialise the state that was established. The primary sporting representation of this new state on the international stage was the establishment of a separate "Free State" soccer association. To this day, all other football codes remain organised on an all-island basis post-partition. This difference is reflected in common parlance where the term "the Republic" is as likely to refer the soccer team as much as it can refer to the state. To coincide with the recent Euro 2020 Qualifying Draw at the National Convention Centre in Dublin, a National Football Exhibition was launched in the Printworks at Dublin Castle. This exhibition will tour the country for the next 18 months in the run up to Dublin hosting four matches in the forthcoming tournament. This exhibition, which focuses primarily on Ireland’s history in the European Championships, raises an interesting question: is now the time for Ireland to develop a national soccer museum? Internationally the idea of a national football museum is increasingly becoming the norm, with even FIFA itself getting in on the act. These national museums range from the slick German Football Museum, which opened in 2015 in its bespoke building in the centre of Dortmund, to The Museum of the Greek National team run as a labour of love by Nikos Flekkas in Chania, Crete. Other examples, such as the National Football Museum in Manchester and the recently opened new US Soccer Hall of Fame in Frisco, Texas illustrate that the importance of location. Both were moved from their less accessible locations of Preston and Oneonta, New York respectively. Exhibitions and events in these museums demonstrate that a national football museum can offer a popular and critical angle to interrogate the national politics, fan cultures, design history, gender representation, aesthetics, community associations and youth pastimes of Ireland. The German Football Museum, for example, uses football to tackle Germany’s often dark modern history. A possible location for a National Soccer Museum in Ireland could be the soon to be redeveloped Dalymount Park. 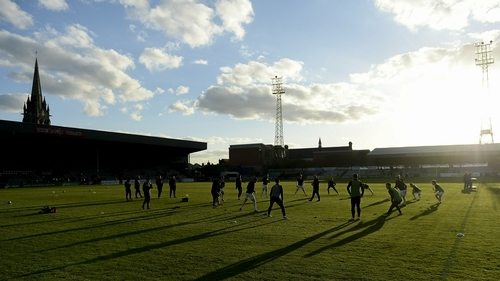 Dalymount, the so-called "home of Irish football", is a richly historic site. In addition to international games, marquee friendlies, iconic floodlights and cup finals, it has even hosted many famous concerts from acts such as Bob Marley, Thin Lizzy and Meat Loaf. With Shelbourne joining Bohemians as co-tenants in the revamped Phibsborough venue, the new stadium is set to become the home of the League of Ireland. With a national museum on site, Dalymount could help to bridge the longstanding rift between the domestic league and national team. There is a certain serendipity to this recently announced delay that the new Dalymount won’t open until 2023. This date coincides with the centenary of the FAI’s official recognition in 1923 and the national team's first match, a 1-0 win over Bulgaria in Paris in the 1924 Olympics. Dalymount even hosted Ireland’s first ever home match in June, 1924, a 3-1 victory over the United States. Perhaps a replay would be a suitable inauguration? Clubs like Manchester United and Barcelona successfully tell their story through museums in their stadia. As the decade of centenaries closes, perhaps it is time to explore the story of soccer in the independent Ireland that followed, given how the sport would become a shibboleth for changes in Irish identity both nationally and internationally. Ireland has a rich soccer history, from being the first "foreign" team to beat England in England, to the time An Cheathrú Rua hosted the UEFA Cup Winners’ Cup. It also already has its own Nikos Flekkas in Eddie O’Mahony. O’Mahony’s growing collection of Irish national team jerseys should undoubtedly form a centrepiece of a national soccer museum as it does in the National Football Exhibition currently touring the country and his recently published book on the history of the national teams' jersey specifically to promote and protect the history of the national team. The GAA museum in Croke Park, currently celebrating its 20th year, is an established part of Dublin’s cultural, educational and archival infrastructure, albeit as part of a greater package that includes a stadium and skyline tour. Despite not having the international pull that a national soccer museum could have, its success is testament to the value of sports museums in Ireland. Given that there is no obvious sporting theme within Ireland’s top visitor attractions, there is clearly a gap in the tourist market. Scotland has a national football museum in Glasgow and the campaign for a Welsh equivalent in Wrexham is well underway. It's time that we start to plan for one for Ireland. "In the 21st century, every day is a football day"